Wednesday May 6th 1896 The boys took an early start to drive the hogs but found it a tedious job. They got back for an early dinner. Father and Mother were out. Will went to town in the afternoon. I sewed on my dress. Thursday May 7th 1896 I was at home at work all day, did some sewing. Will is 48 years old today. He began to plant corn. The weather is growing very hot and dry. 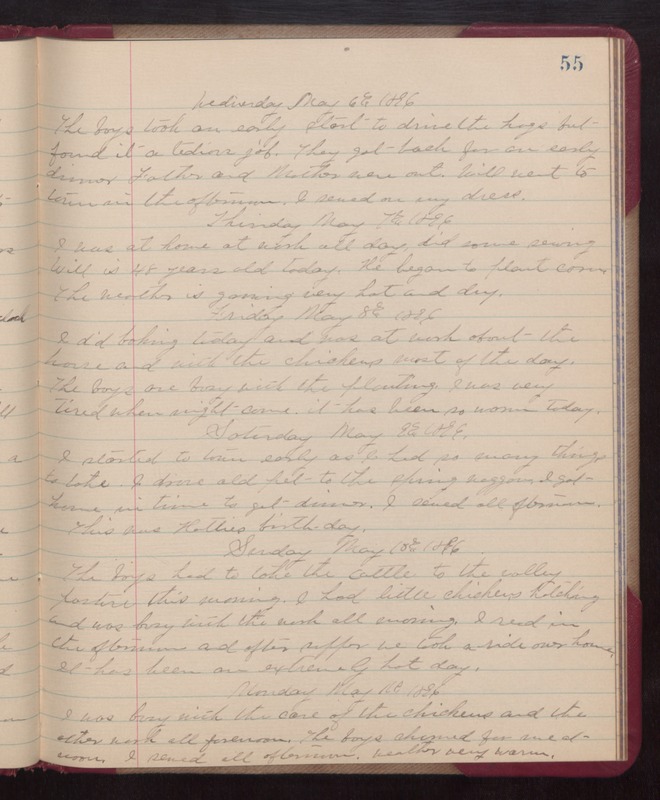 Friday May 8th 1896 I did baking today and was at work about the house and with the chickens most of the day. The boys are busy with the planting. I was very tired when night came. It has been so warm today. Saturday May 9th 1896 I started to town early as I had so many things to take. I drove old Pet to the spring waggon. I got home in time to gt dinner. I sewed all afternoon. This was Hatties birthday. Sunday May 10th 1896 The boys had to take the cattle to the valley pasture this morning. I had little chickens hatching and was busy with the work all morning. I read in the afternoon and after supper we took a ride over home. It has been an extremely hot day. Monday May 11th 1896 I was busy with the care of the chickens and the other work all forenoon. The boys churned for me at noon. I sewed all afternoon. weather very warm.